Best Buy | A Savings WOW! Thanks to Kansas City Mamas for compiling these deals from the Best Buy Black Friday Ad 2013! Mystery Deals: After 10PM CST on Thanksgiving Day, Best Buy will release a set of Mystery Deals that will be available starting at 10 am on Friday Morning. Quantities are limited. No rainchecks or substitutions. 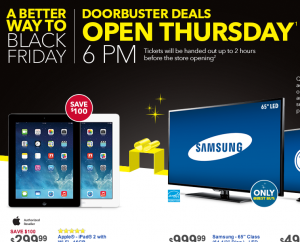 You can view the scan of the Best Buy Black Friday Ad 2013 HERE.